Thousands of protesting farmers listen to their leader at the end of a six-day march on foot, Mumbai, India, March 12, 2018 (AP photo by Rajanish Kakade). 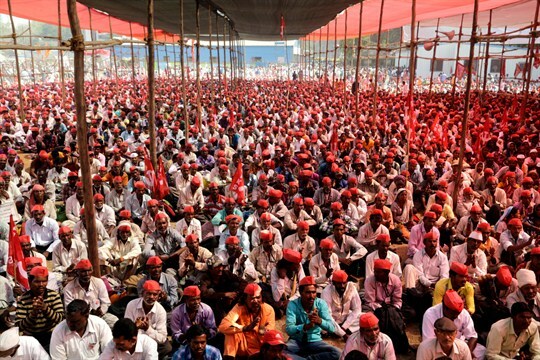 On March 12, thousands of farmers in the Indian state of Maharashtra marched 112 miles to the state capital, Mumbai, demanding government action to address concerns ranging from land transfers to loans. India’s agricultural sector is the country’s largest source of employment, but it is inefficient and largely reliant on dated equipment and technology, and most farmers struggle to make a living. India’s ruling Bharatiya Janata Party, or BJP, which is facing mounting pressure from farmers, has been promising to address their concerns for years; Prime Minister Narendra Modi has vowed to double farmers’ income. In an email interview, Surupa Gupta, an associate professor at the University of Mary Washington in Virginia, explains what is behind the farmers’ demands and the obstacles to attaining them.